Bauan, officially the Municipality of Bauan, (Tagalog: Bayan ng Bauan), is a 1st class municipality in the province of Batangas, Philippines. According to the 2015 census, it has a population of 91,297 people. The mission of Bauan was founded as a visita of Taal in 1590. It was administered by the Augustinians from 1596 and onwards when the first church was built at the slope of Mount Maculot along the southern shores of the Taal Lake until the end of the 19th century. Another church was built in 1667 probably under the supervision of Fr. Jose Rodriguez when it was relocated to Durungao. The church was again relocated in Lonal (or Loual) in 1671 by Fr. Nicolas de Rivera who probably had a new structure built. The last relocation was in 1692 (or 1690) in its present site during the administration of Fr. Simon Martinez who probably had a new church built that was damaged during the typhoon of 1694. Fr. Ignacio Mercado had this rebuilt from 1695 to 1697. The church again suffered damages and was replaced by a stone structure during the administration of Fr. Blas Vidal from 1700 to 1710. Fr. Jose Vitoria who also introduced the cultivation of indigo in Bauan initiated building the present church in 1762 that was continued until 1856 during the administrations of Fr. Jose Trevino and Fr. Hipolito Huerta. It was completed under the supervision of Fr. Felipe Bravo in 1881. From there until 1894, final decorations were supervised by Fr. Moises Santos and Fr. Felipe Garcia. The church is said to be the most artistically built in the province of Batangas during that time. Father Bravo was also an imminent botanist who put up a museum of natural history and collected rare books that were lost when the church was razed by fire during the Philippine revolution against Spain in 1898. The church was probably rebuilt and again destroyed by fire in 1938. It has been restored since then. Five years after the establishment of the ecclesiastical mission of Bauan, a giant cross made of anubing, a local hardwood was found in a dingin (a place of worship) near the town of Alitagtag that was said to have protected people of Bauan from pestilence, locusts, droughts, volcanic eruptions, and Moro raids. Based on a document found in the Bauan Cathedral Archives in 1790, Castro y Amoedo stated that the cross was made in 1595 from a very strong post of a demolished house and erected in the village of Alitagtag to drive away a plague of ghosts. The cross was described as 2.5 meters in height with a 1-meter crosspiece. It featured a golden sun embossed with a human face with radiating rays where the arms intersect (shades of anito worship). The cross was also said to walk around the village (perhaps while driving away the ghosts) and that water gushed from one of its arms. The miracles attributed to the cross attracted many devotees and a decision was made to move it to the bigger Bauan parish church. However, one priest tried to bring the cross to his church in the capital town of Taal but was prevented from doing so when "the sky became cloudy, and it began to thunder and emit dreadful lightning bolts". Before its enshrinement in Bauan however, the cross has decreased in size because devotees has chipped away pieces of the cross that were made into miniature replicas and were worn as necklace talismans. A Fr. Manuel de Zamora was also reported to have cut more than 1/3 from the foot of the cross (that were perhaps made into more miniature replicas) and distributed in Manila where a number of miracles were reported. What was left is what is being venerated today in the Bauan church. The town, the church, and the cross were later moved to a place called Dungarao to escape the violent eruptions of Taal Volcano, then to Loual (or Lonal), in an unidentified place in 1689, and finally to its present site near the sea in 1690 or probably 1692. Today, the people of Bauan pay homage to the cross by dancing the Subli. It is said that the Subli preceded Christianity in the Philippines and was a pre-Spanish religious ritual of the people back then. People still go the dingin or sambahan (where the cross was first erected) to pray. Bauan is a lowland town in central Batangas that hosts some mountains and hills. It also has beach resorts with Sampaguita Beach in barangay Sampaguita in the western part of the town considered one of the more notable ones. The town is bounded by the municipality of San Luis to the north, the municipality of San Pascual to the east, and the municipality of Mabini to the south/southwest. It is also bordered by Balayan Bay to the west and Batangas Bay to the southeast. Vehicles can access the town coming from those towns. According to the Philippine Statistics Authority, the municipality has a land area of 53.31 square kilometres (20.58 sq mi)  constituting 1.71% of the 3,119.75-square-kilometre- (1,204.54 sq mi) total area of Batangas. Bauan is politically subdivided into 40 barangays. Barangay San Teodoro was created in 1953 from the sitio of Pook ng Buhangin from Barrio Ilat and the sitio of Cupang from Barrio Gelerang Kawayan. In 1954, the sitio of Jipit in the barrio of San Antonio was converted into the barrio of Sto. Niño, while the sitio of Pook ni Banal in the Barrio of Malaking Pook was converted into the barrio of Pook ni Banal. The next year, sitio Pinagcurusan in barrio Maricaban and sitio Pinagcurusan in barrio Tingloy were constituted into barrio San Jose, while sitio Pirasan in barrio Payapa was constituted into the barrio of San Juan. In 1956 portions of San Andres and Bolo were separated to form the barrio of San Miguel. The next year, sitio Puting Buhangin of barrio Magalanggalang was converted into barrio Orense. In the 2015 census, Bauan had a population of 91,297. The population density was 1,700 inhabitants per square kilometre (4,400/sq mi). Bauan is one of three political entities included in Metro Batangas, and as such has contributed to its continuous growth in businesses and population. It is also home to a handful of tourist destinations and points of interest. There are many restaurants sprawled across Bauan, including Jollibee, McDonald's, Mang Inasal, and Greenwich. There are also some shopping centers and malls, including Citimart Bauan and Saveway. The town's market is also one of the biggest in Batangas. Fresh fruits, vegetables, meat, and fish are sold there. Household items such as brooms, appliances, sewing supplies can also be found in the town's market. The town is home to the famous Londres, a soft bread coated in sugar, and Pianono, a rolled bread with cream inside. Across from the market is Rory's Refreshment & Eatery, where one of the best lomi in the country can be found. While Bauan is known as "the Gateway to Mabini," an adjacent town known for its beaches, Bauan has Sampaguita beach. It is a long, white-sand beach that is relatively underdeveloped but fairly accessible. It is slowly becoming popular and is already being flocked by tourists. There is also a river in Bauan called the Abaksa River that can be found in between Inicbulan and Balayong. It is a fairly shallow river with cool waters and is also relatively underdeveloped. ^ "Municipal: Bauan, Batangas". PSGC Interactive. 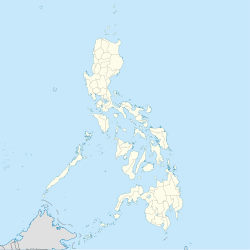 Quezon City, Philippines: Philippine Statistics Authority. Retrieved 8 January 2016. ^ "An Act to Create the Barrio of San Teodoro in the Municipality of Bauan, Province of Batangas". LawPH.com. Retrieved 2011-04-09. ^ "An Act to Convert the Sitio of Jipit, in the Barrio of San Antonio, Municipality of Bauan, Province of Batangas, into a Barrio to Be Known As the Barrio of Sto. Niño". LawPH.com. Retrieved 2011-04-11. ^ "An Act to Convert the Sitio of Pook Ni Banal in the Barrio of Malaking Pook, Municipality of Bauan, Province of Batangas, into a Barrio". LawPH.com. Retrieved 2011-04-11. ^ "An Act Creating the Barrio of San Jose, Maricaban Island, Municipality of Bauan, Province of Batangas". LawPH.com. Retrieved 2011-04-12. ^ "An Act Creating the Barrio of San Juan in Maricaban Island, Municipality of Bauan, Province of Batangas". LawPH.com. Retrieved 2011-04-12. ^ "An Act Creating the Barrio of San Miguel in the Municipality of Bauan, Province of Batangas". LawPH.com. Retrieved 2011-04-12. ^ "An Act Converting the Sitio of Puting Buhangin, Barrio Magalanggalang, Municipality of Bauan, Province of Batangas, into a Barrio of Said Municipality to Be Known As the Barrio of Orense". LawPH.com. Archived from the original on 2012-07-09. Retrieved 2011-04-12. Wikimedia Commons has media related to Bauan, Batangas. Wikisource has the text of the 1911 Encyclopædia Britannica article Bauan.